First step for a successful rain garden: Earn the public's support. Congratulations! You’ve come up with a great idea for an affordable, attractive, environmentally sound solution for the polluted runoff that’s fouling Northwest rivers, lakes, and inland seas. But before you dig up that first shovel full of weedy grass to install your roadside rain garden, take heed: You must get the public (or in the case of a private development, your client) on board first! Puget Sound area governments have been swimming against a small but vocal opposition to rain garden projects on public property that abuts private homes. The most effective way to resolve this backlash is through communication, education, transparency, and lots of dialogue well before a spade hits the soil. Sightline recently convened a group of city and county representatives and some private individuals to talk about how best to earn support for rain gardens and other low-impact development projects built for treating polluted stormwater. Portland cityscape, Brian Legate, Flickr. The number one tip from Portland’s stormwater experts: start talking to property owners as soon as possible! It’s essential, they said, to educate residents and business owners about the problems being caused by polluted stormwater runoff and how green solutions on or near their property can fix it affordably and attractively. Nelson recommends contacting neighbors many months before even presenting specific proposals for projects. Some property owners are not going to be receptive to getting a rain garden in front of their home or business no matter how persuasive your argument, and it’s better to know this sooner than later so you can move an installation to another spot. Once supportive neighbors are identified, the Portland officials work with them to create a rain garden they’ll like, including letting them choose some of the bulbs and trees that will be installed. “I hope we are leaving behind people who wake up and look out their door and say what a neat green street,” Nelson said. Cycling in Portland, carfreedays, Flickr. Portland officials have also partnered with Portland State University to research their outreach campaigns to determine which types of communication work best. One lesson they learned was that residents didn’t care for email communication, but did like a small ad that was routinely published in a neighborhood newspaper. Green stormwater solutions are great for lots of reasons, but not all of the arguments for them will resonate with everyone. There’s the obvious line of persuasion: green stormwater solutions will help the environment. But this angle only works if residents and business owners feel a personal connection to local bodies of water. In Portland, officials emphasize the importance of the Willamette River and how the stormwater sluicing past your house eventually dumps into the river. Then there’s the economic case, which Portland officials make at least two ways. First, when a stormwater project is being developed, they try to get cost estimates for gray infrastructure, green infrastructure and a combo approach. Frequently they’ve found that the low-impact development pencils out better than conventional infrastructure for green streets and ecoroofs alike. Second, Portland officials monitor their rain gardens and other infrastructure so that they can report how much water and pollution is being treated. This data can also be great for winning over skeptical engineers and colleagues. Finally, there’s the yuck factor. When conventional stormwater systems fail, basements fill with polluted rainwater runoff or sewage waste from overwhelmed sewer systems. Poorly draining streets become sodden lakes that send sheets of dirty water across windshields and soak your shoes. Proponents of green infrastructure can remind people that rain gardens, ecoroofs, cisterns, and other low-impact development projects can solve these nasty problems. Green solutions soak the water into the soil or channel it into rain barrels where it falls, instead of funneling it into basements and puddles. Cities and counties for years have successfully dangled incentives in order to get residents and businesses to embrace green stormwater solutions. Portland has one of the most ambitious incentive programs, namely its rebate of up to $5 per square foot for the installation of ecoroofs. The city now boasts at least 355 ecoroofs covering 17.7 acres. In the past, Portland and Bremerton gave rebates to homeowners who disconnected their downspouts from the municipal sewer system, reducing the likelihood of sewage overflows into local lakes, rivers and Puget Sound. Once these programs met their goals, they were discontinued. Seattle’s RainWise program gives rebates for installations of rain gardens and cisterns in certain neighborhoods with sewage overflow problems. Numerous cities have programs that hand out free trees, a stormwater tool that’s easily overlooked. But there’s another point to keep in mind: people don’t always need giveaways and discounts. Sometimes what folks want is hand holding more than handouts. They’re hungry for technical advice, expertise, and support in installing low-impact development projects on their property. Portland officials in particular have been up front about their goals for green installations. The city’s Grey to Green program spells out specifically what they want to accomplish: 43 acres of green roofs, plant 33,000 new yard trees and 50,000 new street trees, construct 920 new green street facilities, etc. And they let folks know how they’re doing in terms of meeting those goals so residents and business owners can track the progress. Roadside rain gardens in Seattle’s High Point neighborhood, Brett VA, Flickr. 6. Won’t you be my <green> neighbor? Folks promoting green infrastructure will tell you one thing: there’s no better advocate for a project than a neighbor. People have mixed feelings about government representatives and enviros, but if your next door neighbor is making the argument for a rain garden in your parking strip, that’s a powerful endorsement. Volunteers planting a rain garden in Puyallup, robinsan, Flickr. 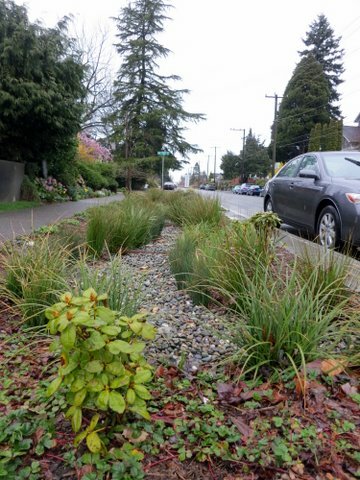 Puyallup has built grassroots support in part through block parties that the city hosts when installing multiple rain gardens along a street. They hand out t-shirts marking the event and host information booths. Community members come together and help plant the gardens. In Seattle, city officials regularly organize tours of homes participating in the RainWise program, so interested residents can see the installations firsthand and talk to homeowners about how they’re working out. And Portland is actively working to recruit volunteers willing to help maintain green stormwater installations and do other environmental restoration work. Finding and Fostering Cost-Efficient Options” through Forester University looks interesting. So remember, while you might be eager to get your rain gardens planted and permeable pavers installed, it’s paramount that you gain support from property owners near the project. Be sure to earmark some of your budget for outreach and education because it’s much easier to win folks over before a project starts, than to resolve conflicts with neighbors once you’re underway. Great tips Lisa and thanks for the mention. Starting in 2009, we used most of these ideas to help the neighborhood build seven rain gardens along a single block on 8th Ave NW in Puyallup, which now have grown to 20 along three blocks, including the school and an apartment building. Work will begin soon in the same neighborhood to replace a conventional street with pervious asphalt, pervious sidewalks and 11 road side rain gardens. Community spirit is high, and we expect home values to increase as road construction is completed and rain gardens are planted. Along with Mark Palmer with the city of Puyallup, you guys have been doing terrific work! And I welcome folks from far and wide to share their projects and outreach experiences. Neighbors really do make the best champions for the cause because they simply love their rain gardens and the benefits they provide. This is a great article! I just wanted to point out that another successful green infrastructure program is RiverSmart Homes in Washington, DC. The good folks at DC Dept of Environment (DDOE) manage this program with the help of 4 non-profit partners and it is so popular that there is about a 2 to 3 month waitlist of folks who are signed up for it. The secret to their success has been performing audits for residents’ properties, providing rebates, and contracting out the work on behalf of the property owners (with their input on design and plants/trees of course) so the process is super simple for the average home owner who usually has little to no knowledge of stormwater issues and certainly very little knowledge of how to install a rain garden, rain barrel or green roof. DDOE has also recently completed surveys of homeowners who have participated in their program and over 50% said they participated because of the rebates and the fact that DDOE contracted the installation for them. They also discovered through their survey methods that most participants find out about the program through word of mouth. That’s super interesting. It sounds like a stormwater parallel to energy audit and efficiency upgrade programs, like the one that the City of Seattle sponsors. It’s a model to think about out here. Thanks to Marcy Jaffe for supporting a sustainable Northwest.